LAHORE: A man, who had jumped off a plaza in Lahore in the wake of a fire, succumbed to his injuries at a hospital on Saturday. The deceased, identified as Imran, breathed his last during treatment at the city's Services Hospital, the medical superintendent (MS) of the hospital confirmed. 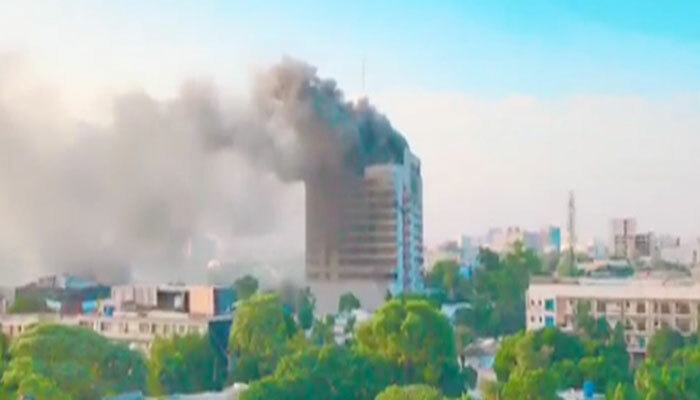 The fire brigade personnel doused off a blaze erupted at the Ali Towers situated on Lahore's MM Alam road. "Every single person was rescued from the building," the provincial information minister Fayaz ul Hasan Chohan said while speaking to the media. "The plaza is owned by former Punjab CM Shehbaz Sharif's son-in-law. Investigations are underway on the cause of the fire," Chohan said while briefing the media over the incident. Lahore Deputy Commissioner Captain (retd) Anwarul Haq said the fire brigade personnel immediately arrived after the blaze erupted at the building's basement.